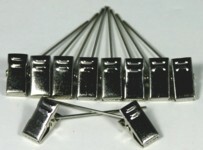 Table cloth clips are chrome plated steel. Turn or carve a shape glue to the shaft of the clip and clip to the table cloth. Adding extra weight will stop the cloth from blowing off in the wind.